KINSHASA, 13 Jun 2006 (IRIN) - The Democratic Republic of Congo (DRC) is preparing to hold its first democratic elections in 45 years on 30 July, but the main political opposition party is not participating. The Union pour la démocratie et le progrès social (UDPS) was known for having stood up to former President Mobutu Sese Seko, who ruled the country from 1965 to 1997. The UDPS leader, Etienne Tshisekedi, was among many who were frequently jailed and even tortured. However, the party never advocated violence to overthrow Mobutu and during the ensuing wars in DRC, its supporters did not take up arms. Now the UDPS opposes the post-conflict peace process, in which the leaders of the various former armed groups share power. Initially, the party boycotted the elections, and although it later agreed to participate, the electoral commission said the period for voters and candidates to register had closed. Political and civic leaders are now sharply divided over whether UDPS should be allowed to participate. QUESTION: What do you think is wrong with the electoral process? ANSWER: UPDS is fighting since 26 years now to install in Congo a rule of law. UDPS didn't take guns like the others. UDPS knows very well that the only way to get power in a democracy is through elections - but what kind of elections? We have said to everybody that the electoral process imposed on the Congolese people is not a good one. The impression we have gotten is that our [international] partners don't want to organise [proper] elections. We can't understand why our partners are just pushing us to go to elections without asking the question, "But what about after the elections?" Q: What, specifically, are your misgivings? A: When we were in South Africa [during the Inter-Congolese dialogue with the country's various armed groups and political parties], we signed the [2002 Sun City peace] agreement, and this agreement allowed us to create the electoral commission. We fixed all the tasks that the electoral commission should follow. But our [international] partners decided to ignore some tasks - important tasks. Among them was the census. It is said that four million are dead [from DRC's civil war]. It means we have to know what has happened in terms of demography, not only in a general sense, but also in each area. We are going to elect not only a president, but also members of congress in each area - and they say we don't need a census. What kind of an election are they planning? Secondly, we decided [at Sun City] that the final step should be presidential elections. Why? Because the last time we did elections was [more than] 40 years ago. Whole generations of people in this country do not know what elections mean. So we decided that we would go slowly, starting with local elections, then provincial elections, then legislative elections and finally presidential elections. But [the international community and the electoral commission] decided to change all this. They decided to start with presidential elections. We asked them why? No answer. And now we see political and social tension. It was predictable. Thirdly, we decided in South Africa to organise elections in two years and everything should be done within this time. We also decided that we could add 12 more months after the first two years if there were problems linked to the elections. After the first two years, there were problems, but they were not linked to the elections. The president and the four vice-presidents spent their time looting this country, spoiling everything. So we said no to a 12-month delay because the reason for the delay was not linked to the elections. But all the high-ranking men of the European Union came to see us, the Secretary-General of the United Nations came here, everybody came saying, "It's not the end of the world, it's only 12 months." And so we agreed. That was 30 June 2005, which means the deadline should have been 30 June 2006. And today, they are saying we can't organise elections within three years. Now the first round of presidential elections is set for 30 July. But what about the second round? What about provincial elections? What about local elections? They are leading us to 2007, 2008. We can't agree. A: Our solution is simple. We want good governance in this country. The main actors have to sit down along with the international actors. We have to say that elections are good but we are doing them in a bad way. It's the first time we are facing elections in this country, so we can't avoid all problems. But if something changes in an agreement, we must decide together how to modify the agreement, so if the modification is good, it will be good for everybody. If it's bad, it will be bad for everybody. Everyone will have to share the consequences of the modification. Our [international] partners have to help us with the culture of democracy, good governance, respecting texts, respecting agreements, not like now - with one group supported by the international community, getting the benefits of the modifications - while other groups, among them UDPS, are supposed to support the bad consequences. We can't agree. So the solution is to bring people together. It will not take more than two weeks. We can save this game; otherwise we will be postponing far worse problems. Q: So you are calling for further delays in the elections on the grounds that the electoral commission has delayed beyond its three-year deadline. Isn't that a contradiction? A: It's not a contradiction. Six months ago, when we wanted to get involved, we said we have members who haven't been registered. Please open some offices to register them. We said that our competitors, the other parties, are represented in the electoral commission and the media authority. We asked to be able to participate in these two institutions, to be put on the same level as them. You know what their answer was? We have no time. We will not meet our calendar of 30 June. Now they have missed their deadline. So now they can agree to what they refused us. We are also asking for more time because they have shown us that they are not able to lead this transition period, and not only in terms of elections. The IMF [International Monetary Fund] and World Bank have suspended financing because of corruption. [The leaders of the transitional government] are still the chiefs of gangs. They are not able to lead this country in so many ways. And so, morally, we now have to help them. We have to say to them, "Let's sit around the table. Let's look together [at solving the problems] and not throwing the baby out with the dirty water." Q: If the elections go ahead on 30 July, what do you fear will happen? A: Elections will be the destruction of this country. We are even scared it can happen before the elections, before July. Consider this: We decided during [the 2002 peace agreement] to create an integrated army from the different militias [and rebel groups in the conflict]. MONUC [the United Nations peacekeeping mission in DRC] made a census of the number of combatants in the various groups and came up with [a total of] 175,000, not including those still hiding in the bush. Now they are talking about an integrated army of nine brigades. One brigade has less than 4,000 soldiers. That means a total of less than 50,000 soldiers. What about the rest? All those militias belong to the warlords [Vice-President Jean Pierre] Bemba, [President Joseph] Kabila, [Vice-President Azarias] and Ruberwa. So do you think that in such conditions, you will get elections and get everybody to agree to such elections? I am sure you have heard that here in Maluku, just 50km from Kinshasa, Bemba is training people. Kabila's [presidential] guards are spread everywhere in this country. Laurent Nkunda, the former RCD [Rassemblement congolais pour la democratie] army general has now rebelled against Kinshasa. He is there in the bush near Goma, with his combatants, and we have heard that he is continuing his operations. And it's known by MONUC, by everyone. Everyone has eyes to see it. We have 17,000 soldiers of MONUC, but Ituri [Province] is still Ituri. North Katanga [Province] is still north Katanga. Of the Interhamwe [militia from neighbouring Rwanda accused of taking part in the 1994 genocide], 15,000 are still there. MONUC is pushing them deeper into the bush, not returning them to their own country. What kind of elections do they want us to go to? If we don't face those problems, if we don't sit down together, the future is simple. Q: You said before that you have the impression the international community does not want to see proper elections in the DRC. What do you mean? A: This is painful for us. 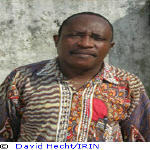 Liberia had an elected president who was arrested because of his implication in crimes. In Haiti, the rebels came into Port-au-Prince, but they didn't get power. But in Congo, we have a different solution. People who have guns have power, and they are backed by all the Western countries. They are in power not because they have shown us that they are good leaders. Reports by UN experts conclude that they are looters. But they are still there. Why? Because it will be difficult to find other puppets like those men. Look at the mineral resources of Congo. Compare Chile, the world's largest producer of copper, which has a maximum ratio of 0.18 copper in its soil, to Congo, which has a minimum of 3 percent. Our mineral resources are making men crazy. No matter that we didn't properly organise the first elections in 40 years. It's Africa. We have a pretext to maintain mismanagement. And after this, they will say the Congolese people are not capable of managing such a big country and it would be better to have it in parts, like Yugoslavia. The elections are like a showcase, but behind it is a masquerade to legitimise looters and their foreign supporters. I have [copies of] agreements, which I brought here for you to see. They are with Canadian, American, French and Belgian [companies]. How can you give 84 percent of all copper [concessions] to one man, [George] Forrest, a Belgian citizen working with multinationals? How can you give someone 90 percent of cobalt [concessions]? Congo has the largest deposits of cobalt in the world. It means you have given someone almost all the cobalt of the world, without a tender. UDPS is not a communist party. We are a democratic party - 26 years against Mobutu, no guns. During the Mobutu regime, Tshisekedi was arrested more than 30 times - and when I say arrested, it doesn't mean for an hour but for months and years. He was exiled in his village several times and physically tortured. And when [Laurent] Kabila came, he said no political activities, no political parties. Tshisekedi said no. We had a dictatorship with Mobutu, and we refused this. You can't be higher than Mobutu. So Kabila took Tshisekedi and sent him to his village in exile for six months. We are made out to be the devils, while the rebels - who are responsible for four million dead - become angels, just because of resources. It's shameful.